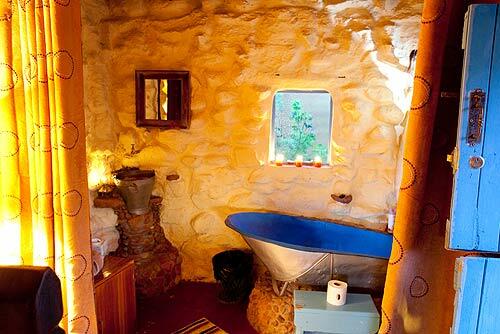 "A very small and basic room for people who'd like to experience primitive South African living". Pieter se skryfhuisie (Pieter´s writing cottage) is the place where playwright and Hertzog Prize winner Pieter Fourie penned several plays that thrilled audiences nationwide. Here a lifetime´s inspiration flowed into works such as Boetman is die bliksem in!, Naelstring and Elke duim ´n koning. The raw, earthy quality of Pieter´s work is reflected in the stylish simplicity with which this cottage was decorated. The milk pail that serves as the basin, the buck hoof towel hook and the paraffin lantern could just as well have made their appearance in one of Pieter´s many works for the theatre. 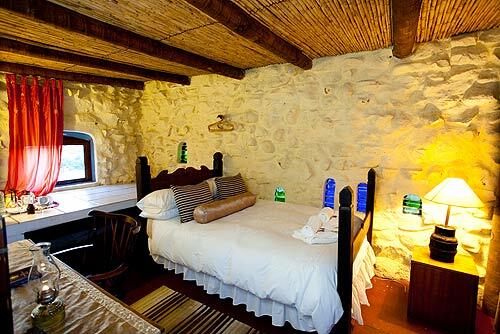 A unique feature of this cottage is the coloured glass bottle windows that capture the many-splendoured nature of Pieter's characters in a distinct way.